The following is an example of an average trip to the grocery store. Read through and identify ways the grocery store tries to get you to purchase more than you planned on. Keep reading afterwards to see if you found them all. You look in the refrigerator and there’s nothing there. Look in your cupboards….nothing. It’s time for a trip to the grocery store. You just need the basics. Bread, eggs, milk and cereal. After perusing the parking lot for five minutes trying to find the closest spot possible, you finally settle for one ten spaces from the front. You walk to the store front and grab a cart. It’s one of those carts that could hold all six of your elementary age nieces and nephews. Through the front doors you go and BAM! You’re hit with the smell of garden-fresh flowers and this morning’s freshly baked bread and bagels. You think of all the sandwiches you could make with a loaf of bread and head that direction. Before getting to the bread on the side of the store you are distracted by the brightly colored fruits and vegetables. Tomato, avocado, lettuce and onion are all good on sandwiches. Into the cart they go. It’s cheaper to buy a head of lettuce instead of a bag so you pick one up. While setting it in your cart you realize how much lettuce that really is. You’re going to need it for way more than just sandwiches. Above the lettuce is a large assortment of salad dressing. Perfect. You grab some Ranch since it’s so versatile. Then you reach a little to your right and grab a bag of garlic croutons to garnish your salad. Back to the bread. As you near the bakery, your senses go crazy with that homemade smell. You start to realize how hungry you really are. There’s a “Store Special” for three loaves of bread for $6.00. You get three. Next on your list, milk. Thankfully, the milk is on the other side of the store which gives you more time to walk around, procrastinating homework. First you pass the deli meat you need for the sandwiches you’ll make. Next to the deli meat is cheese. For the sandwiches you grab some pre-sliced swiss, and then you decide to also get a block of cheddar so you can make grilled cheese sandwiches. You’re almost to the milk, but before you get there you see the yogurt. There’s a special going on! Ten cups of your favorite Greek yogurt for only $10.00. Obviously you grab ten. Finally you get your milk. The eggs are right after the milk so you add a dozen to your cart…which still seems rather empty. Before heading to the register there’s one more thing you need: cereal. You’re just about to reach the aisle when you see a beautiful display of cake mixes on the end of an aisle. It’s a good thing you walked past this because it’s your roommate’s birthday tomorrow and no one has volunteered to make a cake. You grab a cake mix, can of frosting and a box of candles. Cereal…there are so many choices! Since you just remembered you are supposed to be on campus in five minutes you grab the name brand Frosted Flakes right in front of your face and rush over to the checkout. The self-checkout lanes are all closed, so you hop in a regular one and anxiously await your turn. While waiting, you grab a pack of razors (you were almost out) and a snickers bar (because you bought stuff for salads and deserve a little dessert). The cashier rings you up and when the final price pops up you can’t believe how much you’re spending when all you needed was bread, eggs, milk and cereal. 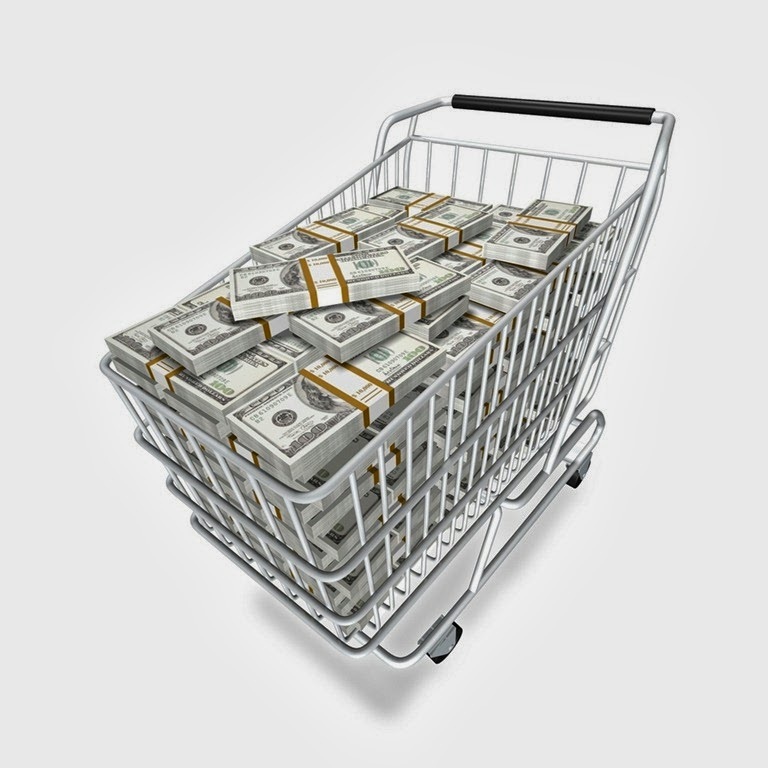 Large Carts– Grocery carts are getting larger and larger. Think WINCO. To avoid making too many purchases, grab a basket or small cart. Fresh Smells– Many stores put sections that give off a great smell at the front such as the bakery and floral section. This 1) puts you in a good mood and 2) gets your salivary glands going, causing you to think you’re hungrier than you really are. To avoid this trap, make sure not to go grocery shopping on an empty stomach. Staples at the Back– Basic foods such as bread, milk and eggs are always at the back of the store. In order to get them, a customer must walk past thousands of other food items they convince themselves they need. To resist the impulse buy, go shopping with a list and stick to it. Grouping Foods- Store will group items of food together for easy access. Salad dressing by the salad. Everything for a cake in one spot. Chips and salsa. Hamburger buns by the hamburger meat. Chocolate, marshmallows and graham crackers. The list goes on and on. “Deals”- Look out for what actually is a deal and what is not. 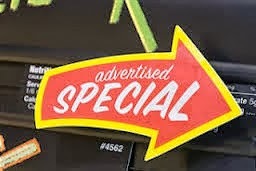 Many stores will have signs that look very similar to the SALE signs but are actually just telling you the regular price of the item. Also beware of buying too much of something (ie bread or yogurt) just because it’s on sale. One person will probably not go through three loaves of bread before the last one gets moldy. Spare your money and just buy what you’ll eat. Shelf Placement- This is most easily seen in the cereal isle. 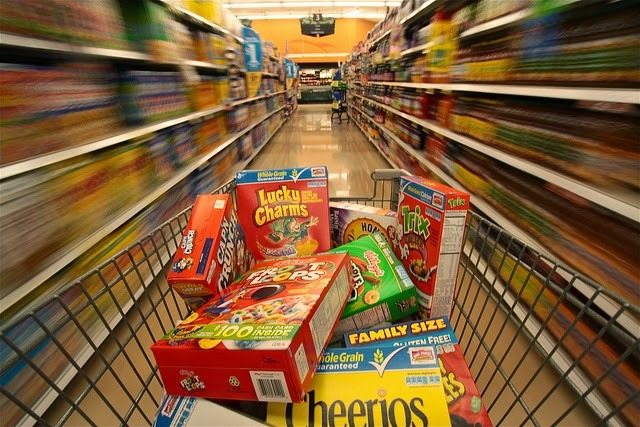 The bulk and off-brand cereals are placed on the bottom shelf, the healthy cereals on the top shelf and the expensive, sugary, name-brand cereals are placed at eye level. Companies actually pay for shelf space, and it costs more to have your product sitting on the middle shelves. Stores also place items they want sold on the ends of the isle so they are more visible. The Checkout Line– This area includes handy items such as razors and batteries as well as magazines, candy, beef jerky and gift cards. You’ll find them all in the checkout line and more than likely, you’ll grab at least one. Try using the self-checkout so you won’t even be tempted. Next time you’re at the grocery store, keep in mind all the methods being used to entice you to spend money. Try to identify ways not mentioned in this post and leave a comment when you find one. Happy shopping!